The Browning MicroBlast Knife/Light Combo are tools that every country or city girl would need, and should carry at all times. This is a manual folding knife, perfect for your pocket, and a flashlight that easily hangs on your keychain or clipped on the brim of your hat. The flashlight is water resistant, takes one AAA battery (included) and lasts up to 7 hours at 15 Lumens. The knife has a stainless steel, drop point blade with a bead blast finish. 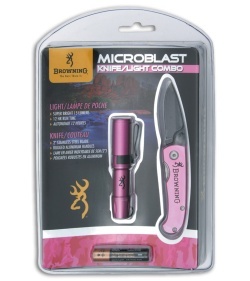 Pink aluminum for both the handle on knife and the casing on flashlight. Pocket clip included on both.